This weeks Featured Feline is Pitstop. Pitstop is looking for his forever home and hopes you will stop by for a visit with him. 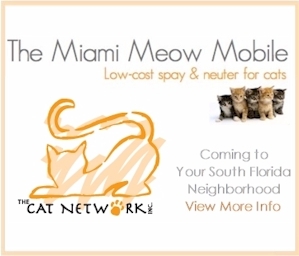 If you would like more information about Pitstop, please contact his foster parent Alan D. via email or through The Cat Network at 305-255-3482 and ask for Pitstop or visit http://cats.thecatnetwork.org/bios/pitstop_ad.html.